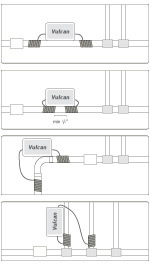 The Vulcan descaler is designed for an easy do-it-yourself installation. You don't need a special plumber to install Vulcan. You can install Vulcan in 10 up to 15 minutes. For the installation no tools are required and you don't have to cut the pipe. 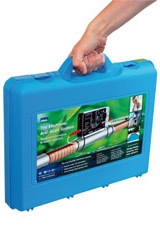 For optimal water treatment Vulcan is best installed near the water meter or at the main water supply. The impulse band windings can be placed on the left side, on the right side or underneath the electronic device. Leave a safe distance of at least 1 cm (min. ~1/2”) from each other. Vulcan can be installed vertically, horizontally or at any other angle. If there is no space available on the pipe the device can also be wall-mounted. In case of limited space the windings can be placed partly on the main pipe and partly on the distributor pipe. All these different installations are possible because the treatment impulses extend over several meters to either side of the pipes.